ABOVE: Meilen, on Lake Zürich. 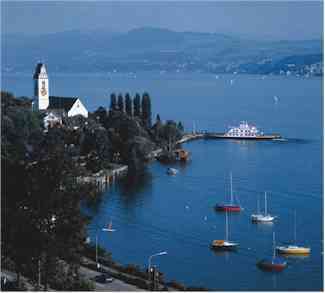 Its official name is Zürichsee, but it's known as the Zürisee in the local Züritüütsch dialect. By any name, Lake Zürich is a delightful place to spend a day, preferably aboard a lake steamer. Boat cruises run from the main Zürich boat landing at Bürkliplatz to Rapperswil, with one boat a day continuing to Schmerikon at the far end of the lake. Total journey time varies by route and season. Take a morning ship fom Z�rich to Rapperswil. After arriving in Rapperswil, spend the rest of your day there and head back to the city on the Rapperswil-Meilen-Zürich railroad line. Trains leave Rapperswil twice an hour, arriving at the Zürich Stadelhofen railroad station 35 minutes later and at Zürich Hauptbahnhof (the main railroad station) 3 minutes after that. The ZSG offers a full menu of "Rundfahrten" or roundtrip excursion tickets during the summer, with durations that range from 1-1/2 to 7 hours. In the evenings, you can select from themed "Traumschiff" or "Dream Ship" cruises year-round. For example, you could take a cruise with the theme of German Schlager (sappy vintage pop music), cheese fondue, Chinese fondue, a dinner of meats cooked on hot lava rocks, or a "singles party." The last time we checked, the company even had a "BBQ Ship" every Thursday in July and August. Lunch cruises are also available. Visit the official ZSG Web site, which has text in German and English, or see route 3730 in the Swiss Official Timetable. You can also check the timetable boards or with a ticket agent at the steamer pier in Zürich, which is next to the Bürkliplatz (where the Bahnhofstrasse meets the lake). Cruise Switzerland's lakes on commuter boats and historic paddlewheelers. The boats often stop near railway stations, and you can travel free with your Swiss Pass. Links to articles on Zürich's hotels, shopping, airport, and local transportation.